With the ability to fit almost any open coil spring, the new Air Lift 1000 Universal kits from Air Lift is the most versatile ever. These new kits provide your vehicle with up to 1000 lbs. of load-leveling support, making your ride smooth and comfortable. Air Lift 100 Universal springs air to improve all aspects of your ride, eliminating squat, fixing poor headlight aim, and soaks up bumps, eliminating any sort of rough ride. Your coil-strung vehicle will drive smoothly and haul better than ever before with these kits installed. Finding the right kit for your vehicle is simple and as easy as 1-2-3. First, unload your vehicle and allow it to return to normal ride height. Then, measure the available inside height and available inside diameter of the vehicle’s coil springs, finding the available height and width inside the springs. Finally, check out the chart provided by Air Lift and match your measurements with the corresponding kit numbers. 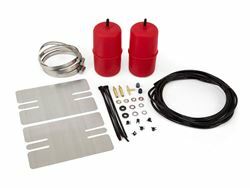 Each Air Lift 1000 Universal Air Spring kit comes fully equipped with every part needed for a full installation. This includes two Air Lift 1000 air springs, made from durable, molded polyurethane, and two heat shields, with clamps. The kit also contains air line, tee, zip ties, two Schrader values, air spring spacers (if applicable), and, of course, detailed installation guides with advice for proper installation. Air Lift’s new Universal 1000 kits aim to take the rough out of your coil-sprung vehicle’s ride. Air Lift will fit almost every open coil spring, adding load-leveling support, with an easy to find system.